There are 60 million health care workers globally and most of this workforce consists of nurses, as they are key providers of primary health care. Historically, the global nurse occupation has been predominately female and segregated along gendered, racialised and classed hierarchies. In the last decade, new actors have emerged in the management of health care human resources, specifically from the corporate sector, which has created new interactions, networks, and organisational practices. 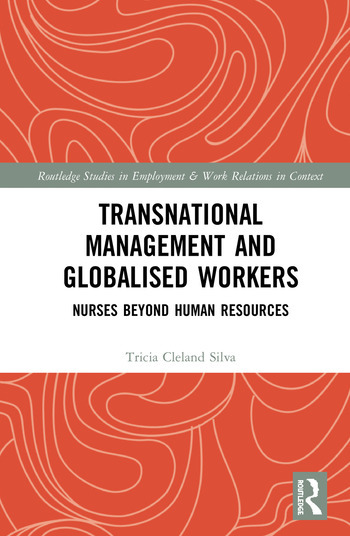 This book urgently calls for the reconceptualisation in the theoretical framing of the globalised nurse occupation from International Human Resource Management (IHRM) to Transnational Human Resource Management (THRM). Specifically, the book draws on critical human resource management literature and transnational feminist theories to frame the strategies and practices used to manage nurses across geographical sites of knowledge production and power, which centralise on how and by whom nurses are managed. In its current managerial form, the author argues that the nurses are constructed and produced as resources to be packaged for clients in public and private organisations. What is discourse and why analyse it? Tricia Cleland Silva is a Lecturer and Post Doctoral Researcher at Hanken School of Economics, Finland. She is the co-founder of Metaphora International, a consultancy that works with finding meaning in management and strategy through stories and metaphors.